In the hot, dry climate of Lillooet, the scents of sage, yarrow and Blacked-eyed Susans hang in the mid-summer air. To this day, these fragrances still take Kerri Pfeifer back to her remote hometown, a place that ignited her passion for working with the natural world. For over 8 years , Kerri has channeled that feeling into her work with flowers. 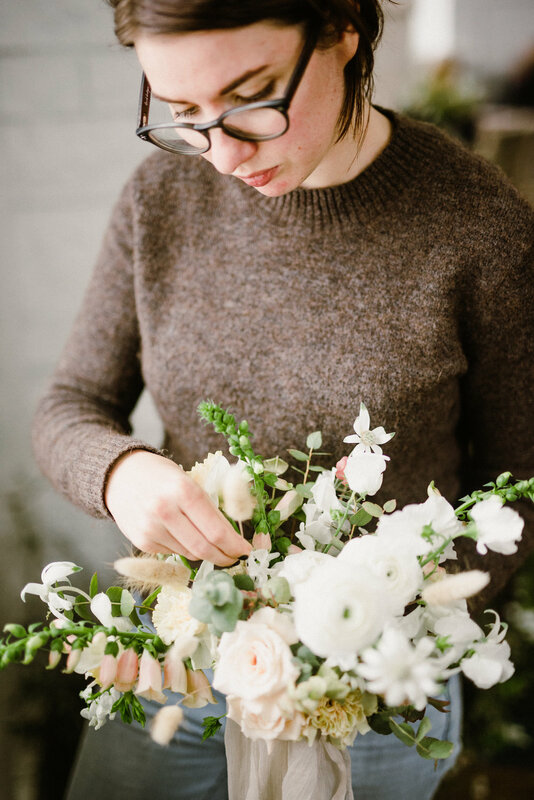 Drawing inspiration from her childhood memories, along with new one’s created on long walks through the lush rainforests of Vancouver, Kerri’s design combines classical florals with local, foraged elements. The resulting arrangements and bouquets are unexpected, yet breathtaking. Kerri’s work has been featured on Once Wed, Style Me Pretty, 100 Layer Cake, Green Wedding Shoes, Real Weddings, and more. She works from her home studio in East Vancouver where she tends to her garden and lives with her husband, young daughter, and two cats.